TWO friends obsessed with Norwegian mass murderer Anders Breivik plotted a far-right hate campaign in Torbay, a court was told today. The pair styled themselves as Knights Templar in homage to Breivik and sent letters to Islamic centres telling worshippers to leave the country. He had previously admitted conspiracy to cause criminal damage and to send malicious communications. Roddy, from Torquay, walked away from court with a suspended jail sentence. He admitted the conspiracy charges and possessing a terror manual on his computer. 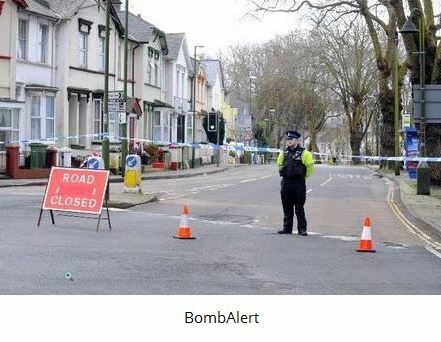 Their arrests came in January after an area of Lymington Road in Torquay was sealed off by armed police who feared they may be dealing with a terrorist cell. Exeter Crown Court was told that police had been hunting whoever was responsible for a series of graffiti attacks on various buildings in Torquay and Brixham dating back to July the previous year. Red spray paint and the initials KT had been daubed on buildings and 72 incidents of criminal damage were later attributed to the pair. Among the buildings targeted were Brixham police station; a council-owned building in St Mary’s Park; the Union Street car park in Torquay and a children’s play area in Plainmoor. Racist slogans were sprayed on the Torquay Islamic Centre. Police analysed Facebook traffic between Roddy and Ruth and discovered the pair had been in conversation about places to target. Roddy’s laptop was found to contain an “al-Qaeda training manual” and Breivik’s ‘2083 A European Declaration of Independence’. Jeremy Atkinson prosecuting, said: “Both developed an obsession with the personality and ideology of Anders Breivik, the convicted Norwegian terrorist and mass murderer. He said in July the pair had taken part in an ‘initiation right’ with each of them branding the other on the upper arm with a hot metal cross to signify their allegiance to the Knights Templar. Identical letters, shown to have been addressed by Roddy and using cut out letters from newspapers, were also sent to mosques in Brighton and Plymouth. Lee Brembridge mitigating for Roddy, now of Old Mill Road,said there was no evidence any of the material found in his possession would be used for terrorist purposes and the material had not been distributed. He said Roddy was shy and had been assessed by a mental health team. He also had Asperger’s and autism. Roddy, he said, had come under the influence of Ruth after the pair met on a bricklayer’s course at South Devon College, at which point his family had started to notice a behavioural change. Kevin Hopper, mitigating for Ruth, said his client was a ‘social inadequate’ who was easily influenced by others. He said Ruth had been 17 at the time and compensation claimed for the graffiti only amounted to £500. But Judge Francis Gilbert QC said the real cost was far higher and ran into thousands of pounds. “At least one of the acts of criminal damage was motivated by racial hatred,” he added. Roddy was given 23 months in a Young Offenders Institution, suspended for two years and 18 months supervision.